We are excited to get in some of the new Paper Salon Tailored Tins. Here is one more new design from them called Sizzle. I took out my punches and also my Coluzzle and as you can see, this stamp set can coordinate a variety circle punches you may have. 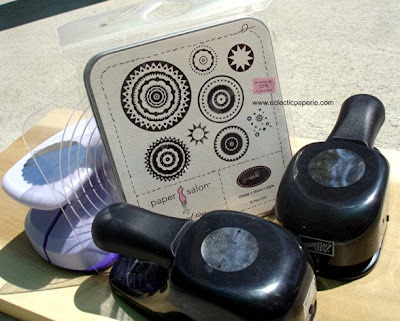 This particular stamp set is just fun with all the cool circle images that can enhance any paper crafting projects. Wouldn't it be fun to stamp and emboss these; then use a punch to really make it pop. How about one flocked with some cool Stampendous Fun Flock? Or use some Stickles on a smaller circle design to create your own page pebble. There are all kinds of possibilities don't you think? Check out some of the other Paper Salon Tailored Tins including the popular Create-a-Flower and new Summer Fun stamp sets. Remember that these are unmounted, die-cut rubber images. Oooh! This set of Paper Salon circles is really a good one! And ... can a girl ever really have tooooo many punches? !